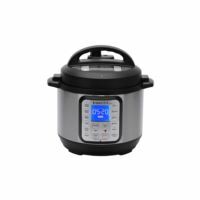 10-in-1 Multi-Use Programmable Pressure Cooker with Advanced Microprocessor Technology, Stainless Steel Cooking Pot – 8 Quart. 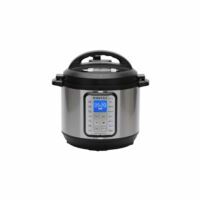 Convenient with Intelligent ProgrammingInstant Pot® Ultra 10-in-1 Multi-Use Programmable Cooker. 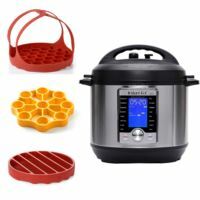 The Ultra combines the functions of a Pressure Cooker, Slow Cooker, Rice/Porridge Cooker, Cake Maker,Yogurt Maker,Sauté/Searing,Steamer,Warmer, Sterilizer, and, truly new and unique feature, the Ultra program.Also includes 3 OXO accessories: Pressure Cooker Rack, Egg Rack, and Bakeware Sling. 10-in-1 Multi-Use Programmable Pressure Cooker with Advanced Microprocessor Technology, Stainless Steel Cooking Pot – 6 Quart. 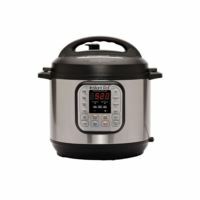 The Ultra combines the functions of a Pressure Cooker, Slow Cooker, Rice/Porridge Cooker, Cake Maker, Yogurt Maker, Sauté/Searing, Steamer, Warmer, Sterilizer, and, truly new and unique feature, the Ultra program. 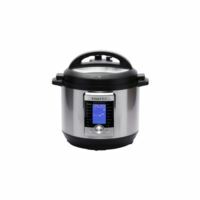 The ‘Ultra' provides complete custom programming for pressure and non-pressure cooking. Also includes 3 OXO accessories: Pressure Cooker Rack, Egg Rack, and Bakeware Sling." The largest version of this multi-cooking Instant Pot speeds up cooking times using less energy to produce healthy, nutritious food. This one-stop multicooker combines all the capabilities of a pressure cooker, slow cooker, rice cooker, browning pan, steamer, yogurt maker, cake maker, warmer and sterilizer in one convenient machine. Instant Pot also offers the unique "ultra" program that allows for customizable pressure and non-pressure cooking. Programmed with 16 function keys for common cooking tasks. Instant Pot® Duo Plus is the next evolution in the Duo Series, the #1 best-selling cooker in the Instant Pot family. The Duo Plus 9-In-1 Programmable kitchen appliance with advanced microprocessor technology incorporates all of the great features that made the Duo the #1 best seller. It has new and improved programs and features to continually support one's fast-paced and healthy lifestyle. Make slow-cooked meals fast with the Instant Pot Duo Plus. 10-in-1 Multi-Use Programmable Pressure Cooker with Advanced Microprocessor Technology, Stainless Steel Cooking Pot – 3 Quart. If you live a fast-paced, healthy, and eco-friendly lifestyle, Instant Pot® is designed specifically for you. 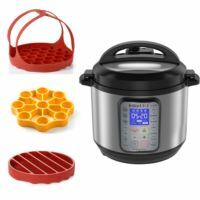 Instant Pot® is a smart Electric Pressure Cooker designed by Canadians with the objective of being Convenient, Dependable and Safe.Also includes 3 OXO accessories: Pressure Cooker Rack, Egg Rack, and Bakeware Sling. The multi-cooking Instant Pot speeds up cooking times using less energy to produce healthy, nutritious food. 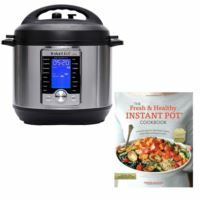 In fact, this one-stop multicooker combines all the capabilities of a pressure cooker, slow cooker, rice cooker, browning pan, steamer, yogurt maker, cake maker, warmer and sterilizer in one convenient machine. 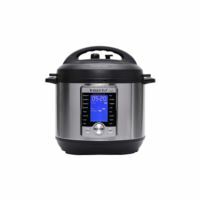 Instant Pot also offers the unique "ultra" program that allows for customizable pressure and non-pressure cooking. Programmed with 16 function keys for common cooking tasks, everyday meals are as easy as a press of the button. Instant Pot® Duo Plus is the next evolution in the Duo Series, the #1 best-selling cooker in the Instant Pot family. Make slow-cooked meals fast with the Instant Pot Duo Plus. This versatile all-in-one kitchen essential offers a whopping nine functions, handling everything from pressure cooking and sautéing to slow cooking and making yogurt, cakes and preserves. An advanced microprocessor speeds up cooking duration by two to six times and uses 70% less energy than average. This smaller version of the multi-cooking Instant Pot speeds up cooking times using less energy to produce healthy, nutritious food. This one-stop multicooker combines all the capabilities of a pressure cooker, slow cooker, rice cooker, browning pan, steamer, yogurt maker, cake maker, warmer and sterilizer in one convenient machine. 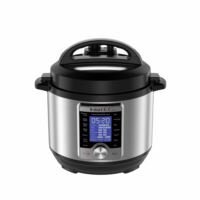 Instant Pot also offers the unique "ultra" program that allows for customizable pressure and non-pressure cooking. Programmed with 14 function keys for common cooking tasks. 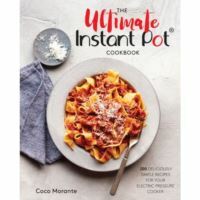 The well-tested, fully authorized recipes in The Ultimate Instant Pot Cookbook cover a range of flavors and occasions, making this the ultimate collection of recipes for the home cook who values the convenience of an electric pressure cooker. This is the only book you'll need when looking for tried-and-true classics like creamy tomato soup, ground beef stroganoff, chicken mushroom casserole, or peach cobbler; international favorites like carnitas, chicken tikka masala, or refried beans. 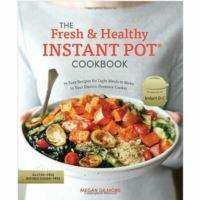 In The Fresh and Healthy Instant Pot Cookbook, Megan Gilmore presents recipes that use easy-to-find, whole-food ingredients for simple weeknight meals from morning to night--through the revolutionary cooking power of the Instant Pot, an electric, programmable multicooker. There are gluten-free options for each recipe, and all recipes are free of refined sugar and many of the most common food allergens, yet don't scrimp on flavor.